Authors Richard Leblanc and Stewart Richardson have teamed up to bring us a promising biography of Hockey Hall of Famer Aubrey "Dit" Clapper. Did you know that there have been 10 players in hockey history who had the mandatory waiting period for induction to the Hockey Hall of Fame waived? There was no denying the rightful inclusion of Rocket Richard, Gordie Howe, Ted Lindsay, Terry Sawchuk, Dit Clapper, Red Kelly, Jean Beliveau, Bobby Orr, Mario Lemieux and Wayne Gretzky. Wait a minute - one of those names sounds a bit off. Every modern fan should be well aware of these ten hockey greats, and for the most part all are. Except for Dit Clapper. Who the heck is Dit Clapper? Clapper was one of the greatest NHL stars of the early years. He was an All Star both as a forward and on defense. He helped the Boston Bruins win three Stanley Cup championships. He was the first player to ever play 20 seasons in the NHL. He was often dubbed "The Lou Gehrig of Hockey." While Eddie Shore and Howie Morenz tend to have stolen history's eternal spotlight from that era, Clapper deserves his share, too. Perhaps this book will go a ways in helping the modern fan appreciate the old game and the old players. The book is very reasonably priced at $20, especially when you consider you get are almost getting two books for the price of one. Not only is this text the leading biographical look at one of hockey's all time greats in Dit Clapper, but it is also an in depth look at hockey history from this era. Boston Bruins fans in particular will appreciate this text, but any hockey fan searching for a better understanding of the NHL's early years will want to read this book. The authors leave no stone unturned on Clapper, digging deeply into his childhood and upbringing while also exploring his life after hanging up the skates. Of course it is his life on the ice that steals the show. Dit Clapper is truly one of hockey's greats yet remains almost unknown by today's fans. 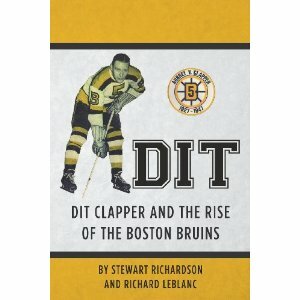 Authors Stewart Richardson and Richard Leblanc go a long ways to correcting that thanks to their new book Dit: Dit Clapper and The Rise Of The Boston Bruins . All real hockey fans should consider giving this one a read. The authors have uncovered some interesting anecdotes and stories surrounding the life of this hockey great. For example they explain how Aubrey Clapper received one of hockey’s great nicknames. They were able collect some long forgotten photographs from Dit early lacrosse days to the night in 1995 when the Bruins raised Dit’s No. 5 into the rafters of the new T.D. Gardens. Interestingly, Dit’s abilities as a teenage lacrosse player in the Hastings-Campbellford area eventually led to his hockey career. Included is a 1923 photograph of Dit and his two brothers, Donald and Bruce when they played field lacrosse for the Toronto Leaside team against their father, Willy’s Hastings team. After Dit finished hockey he returned to Peterborough. His sporting goods store on George Street became the gathering place of the sports fraternity in the city. George “Red” Sullivan worked there in the summers while he was playing in the NHL.